custom homes — Reed Construction Co.
A circular entrance driveway invites guests into this warm stone and brick European styled home. The front entrance porch welcomes all visitors into the spacious foyer with its two storied ceiling and iron railed balcony. The copper covered bay window in the dining room adds additional entertainment area for those large banquets for family and friends. Service doors to the kitchen reveal stained cabinetry enhanced by the granite countertops and stainless steel appliances. Heavily detailed brackets support the kitchen island bar, ready to accommodate a growing family. The spacious bay window in the breakfast and morning room creates a delightful sitting area to enjoy a morning cup of coffee. Step onto the composite decking on the screen porch and enjoy the autumn days with the warmth of the fire in the fireplace. Relax in the family room beside the fireplace and enjoy watching your favorite shows enhanced with surround sound. 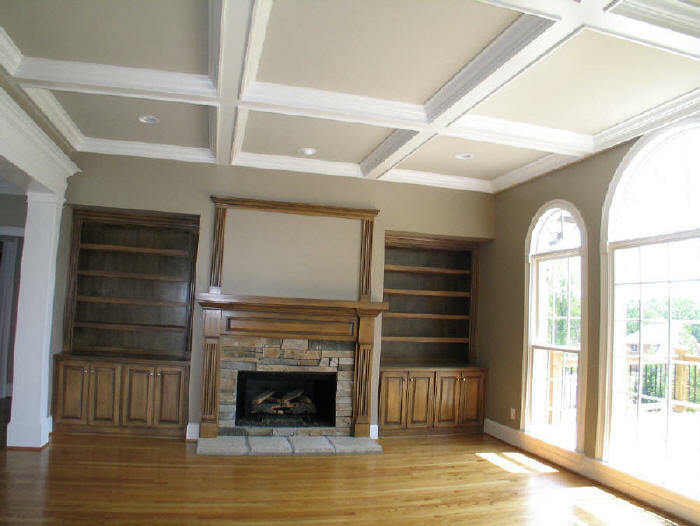 Ten foot coffered ceilings and large circle head windows appoint this room. A private study is equipped with French doors, raised ceilings and a large elliptical window. The first floor master bedroom features a sitting area with a bay window, granite countertops in the bath, whirlpool, slate shower, and two walk-in closets. Ascend the stairs to the second level and find three bedrooms, an exercise or media room, and a playroom equipped with cabinetry and storage closet. One bedroom has a private bath and two share a Jack and Jill bath. A first floor mud room includes a desk, benches with cabinets above, and a separate room for the washer, dryer and utility sink. The oversized garage has plenty of room for storage and there is attic space for storage as well. This well appointed custom home is designed with approximately 4088 square feet of heated space. Stone, Pastel Cote Boral Brick, and casement windows are some of the many features that enhance the charm of this 5 bedroom, Old World style home. The relaxing hearth room with stone fireplace, built-in cabinetry, wet bar, and wood ceiling are only a few steps from the kitchen and breakfast nook. Granite counter tops compliment the glazed kitchen cabinets and the butler’s pantry. The chef of the family will enjoy the stainless steel appliances, the walk-in pantry and the cooking island in this spacious kitchen. Around the corner enter a large dining room surrounded by columns overlooking the family room. From the family room enjoy the cozy fireplace and beautiful views of the rear yard. Also located on the first floor, is the private master suite with access to the study. The master bathroom impresses with its granite counter tops, dressing table, slate floors and shower, whirlpool, and vaulted ceilings. French doors to the study afford privacy when needed. Even the powder room is highlighted with hand painted walls, a special mirror and granite counter tops. Upstairs, discover a large entertainment room and four bedrooms. 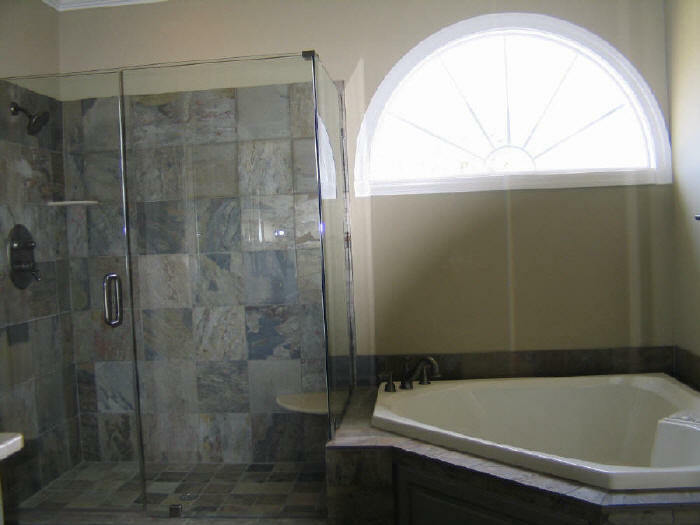 Two bedrooms have private baths and two share a Jack and Jill bath. Outside amenities include a triple garage and a comfortable side porch where the beauty of the changing seasons can be appreciated. This well appointed home is designed in approximately 4479 square feet of heated space.